Gold can be found in most of the States in the United States. Although the gold rush was concentrated in Alaska and California, gold from gold panning has been found in nearly every State. 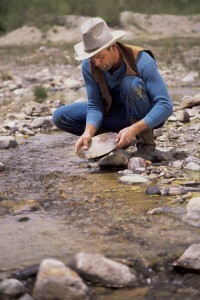 Gold is still abundant and gold panning is a favorite hobby of many. When gold is found in rock, it is referred to as lode gold. Mining lode gold is harder to work with because in order to get to the gold in the ore, it must be blasted and then crushed. If you are interested in gold panning in the United States then you need to concentrate on placer gold. 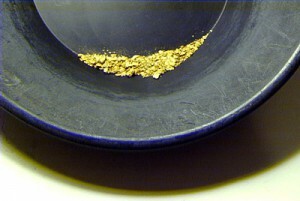 The majority of the gold prospecting the United States is for placer deposits; prospectors can pan for gold, use sluice box or dredge for gold. Placer deposits are gold that is loose and often found in rivers and streams, even dry riverbeds. When gold erodes from the rock, it gets washed away, and into streams and rivers. Gold is heavier than the sediments that make up streambeds and riverbeds so the gold will settle to the bottom. Gold panning right after it rains is an ideal time because it is usually rainwater that carries the gold from the rock and into the rivers and streams. There are a lot of streams and riverbeds in the United States. How do you know where along the river or stream to look for gold? If a section of the river flows quickly, or has rapids, that will be the worst spot to check. Yes, gold is heavier than the river bottom, but quick moving water will wash it further downstream. The best rivers and streams to pan will be slow moving. Because it is heavier, gold tends to deposit into crevice and cracks along the river and stream beds. Any place along the river or stream where the gold can get stuck, such rock outcroppings, rocks, or a bend in the river or stream is a good place to start. Streams that have bedrock are a good place to start and the gold will always be towards the lowest point, thanks to gravity. If you find a stream where it suddenly has a deeper section of water due to the bedrock dropping off, gold is likely to accumulate in that deeper pool of water. Look for irregularities in the riverbed, bedrock, or along a bend in the river to start gold panning. We have gone over how gold will tend to deposit around irregularities in the riverbed or at the base of objects in the river, but gold also is found in the river itself. Not all gold gets caught up in the bends, rocks, or obstacles, gold will travel with the river and because of its weight it tends to take the shortest path along the route, which means that as the river or stream bends, the gold will go from the center of the waterway to the edge and then as the river bends again, instead of following the outside edge, the gold’s path will cross the stream to hug the next turn. The gold’s path will always be the shortest distance between the closest bends in the river, which is usually where the river bends into itself and not away. The easiest way, and the way that requires the least amount of gold finding equipment is gold panning. Not only is gold panning fun, but it is rewarding as well. Gold pans are traditionally made out of steel, but plastic pans are actually preferred. Not only do they work every bit as good as the steel ones do, but they are easier to work with because they are lighter, you can use a magnet with them, and they are durable. For gold panning you need to have your gold pan and a spade or a shovel. You want fill your pan with gravel and sand until it is about ¾ of the way full. Do not fill it all the way to the top. Lower the pan into the water, then rotate, and shake the pan, this will remove sand and sediment from the larger rocks. You can now take out the larger rocks, anything that is larger than about an inch can be removed from the pan; just swish each rock in the water in the gold pan before discarding. With the pan partially submerged, shake the pan side to side. The motion will settle the gold to the pan’s bottom. Tilt the pan so that the edge that is away from you is just under water and continue to gently tip the pan in a forward and back motion instead of side to side. Do this gently. While you are gently tipping the gold pan in the gentle forward and back motion, tilt the pan so the edge away from you is slightly submerged and then continue the forward and back motion. Each time you tip the pan away from yourself; lighter material will wash out and back into the stream. Keep doing this to wash the lighter sand and rock over the edge of the pan and back into the stream. Resume shaking the pan from side to side to settle the gold once again and then repeat the above process to continue to wash away non-gold lighter material out of the pan. Keep alternating between the forward and back motion to wash out lighter material and the side-to-side motion to settle the gold to the bottom of the pan. As larger rocks, gravel or pebbles are revealed, inspect each to make sure that they are not gold, and discard from your pan. As you wash more material out of the pan, it will be necessary to keep increasing the tilt of the gold pan away from you. When you have washed out all but the heaviest, you will have a small amount of sediment in the bottom of the pan, which will be your gold and the black sand that the gold came from. You can use a small amount of water in the pan to swirl the gold around. You will have a mixture of nuggets and fine gold flakes. Keep in mind that you always need to make sure that you are allowed to do gold panning in that area before you start! National Forests do not allow you to pan for gold, so be aware of where you are and where the boundaries are. The Forest Service does allow for prospecting on some of their managed land, subject to following their regulations. Private property requires the permission of the landowner prior to panning and some land may already be claimed. There are gold maps available; it is a smart move to always obtain a map to make sure that you are allowed to prospect prior to starting. Enjoy lots of success on your next gold panning trip! This entry was posted in finding gold, gold panning and tagged gold panning, gold panning in USA, gold panning techniques, placer deposits by Jim. Bookmark the permalink.